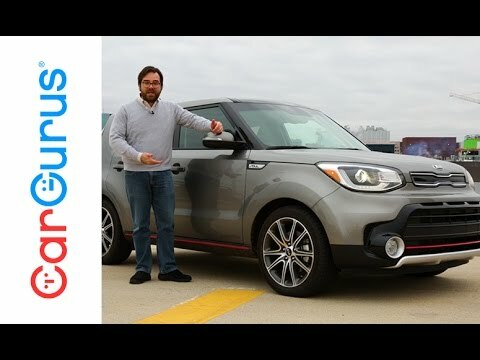 The 2017 Kia Soul gets something the funky little 5-door hatchback has always needed, but never had: abundant horsepower. The Kia Soul Exclaim -- the top-level model -- now comes with a 201-horsepower turbocharged engine. It headlines a host of changes that includes blind-spot monitoring and more. The Soul is also available, but less recommendable, in all-electric form. Kia Soul, the best ride on the road. My vehicle the Kia Soul is a pleasure to drive. It is quiet and rolls along smoothly even on bumpy roads. The Kia accelerates very fast when needed and brakes on a dime. I have had many cars over the years and can honestly say the Kia has been the most pleasurable experience of them all. The Kia has a beautiful dashboard with all the amenities such as telephone, radio, series radio and all the necessary buttons on the tilting steering wheel. I also has a button for overdrive and then the Kia really takes off. The Kia is very economical on gas so much so that my daughter will leave her Jeep in driveway and borrow the Kia. The seats are comfortable and the cargo space could be a bit bigger but the back seats fold down so that enlarges the space. I was able to haul a 55 inch TV in the cargo space without putting the seats down plus my walker was back there too. Yes, I love my Kia Soul and will get the Kia Soul eve when I take this one back to the dealer when my lease is up. I was replacing my 2007 Saturn VUE, so I wanted something I hoped would last as long as it had. Since I'm the only one who drives or uses the vehicle, there is plenty of room, especially in the front seat area since I spend all my time there. The seating is comfortable; not cramped, so that it has the feeling of a larger, more luxurious vehicle. The car accelerates the way I want; can hit 50-60 in a few seconds so I can enter quickly enter traffic. The car is low maintenance so far and doesn't eat up gasoline. I love the heated seats; the air conditioning is always at a good level. I like my modern electronics such as Bluetooth. So far, I don't DISLIKE anything, but the car was bought new and isn't that old. Mood rings and music are a wonderful feature. This is the third Kia Soul that I have owned and I love the vehicle. Have had no issues or problems with any of my Kia vehicles. I have found them to be very dependable cars and economical to operate. Gas mileage is very good and they are comfortable even on longer road trips. You can select from a wide range of options to suit your driving and your pocketbook. I especially like the fact that the back seats fold down and give you a large area to load with all types of cargo. And lets not forget all of the cool colors for the Kia Soul. No other car company can match the bold colors of Kia. I highly recommend Kia and hope that you give them a try soon, also.